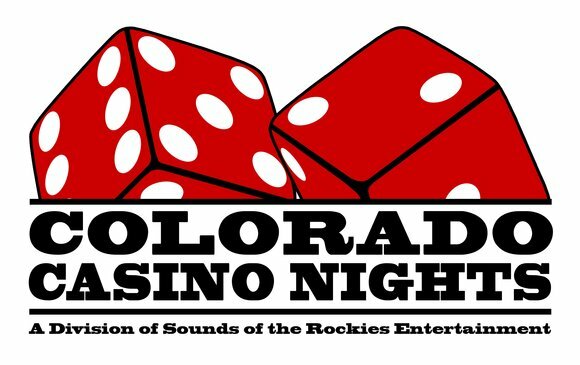 Colorado Casino Nights offers full size, high quality furniture grade Casino Roulette table with original casino layout. 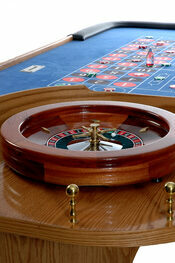 This is an authentic Roulette Table. Holds up to 9 Players. Roulette is a casino game named after the French word meaning "small wheel". In the game a dealer spins a wheel in one direction, then spins a ball in the opposite direction around a tilted circular surface running around the circumference of the wheel. The ball eventually falls onto the wheel and into one of the 38 colored and numbered pockets on the wheel. The players place bets on the felted section trying to guess were the ball will land. LED Roulette Table is Also Available! Actual pictures are shown of our of our equipment. The main pockets are numbered from 1 to 36 alternating between red and black, but the pockets are not in numerical order around the wheel, and there are instances of consecutive numbers being the same color. There is a green pocket numbered 0, and in American Roulette there is also a second green pocket marked 00. Players can place a variety of 'inside' bets (selecting the number of the pocket the ball will land in, or range of pockets based on their position), and 'outside' bets (including bets on various positional groupings of pockets, pocket colors, or whether it is odd or even). The payout odds for each type of bet is based on its probability. There are usually posted rules for table minimum and maximum bets, and these rules usually apply separately for all of a players 'inside' and 'outside' bets for each spin. 12 1 2 3 ? odd 7 8 9 ? 12 13 14 15 ? blk 19 20 21 ? 12 25 26 27 ? 36 31 32 33 ? Straight: a single number. The chip is placed entirely on the middle of a number square. Street: a bet on three numbers on a single horizontal line. The chip is placed on the edge of line of a number at the end of the line (either the left or the right, depending on the layout). Corner (or square): a bet on four numbers in a square layout (as in 11-12-14-15). The chip is placed at the horizontal and vertical intersection of the lines around the numbers. Sixline (or 'sixaine'): a bet on two adjoining streets, with the chip placed at the corresponding intersection, as if in between where two street bets would be placed. Even Money Bets: a bet on 18 numbers. This is placed in the a box representing the attribute (black/red/low/high/even/odd) that you wish to bet on. Group Bets: a bet on the first, second, or third group of twelve numbers.